Franz Bauer was born on 18 November 1915. Bauer was serving with Jagdfliegerschule 5 in an instructing role in July 1941. Leutnant Bauer was assigned to 4.(Eins. )/JFS 5 based at Octeville in France. In addition to providing operational training to budding fighter pilots, JFS 5 was also tasked with the fighter protection of the port of Le Havre and the neighbouring coastal region being subordinated to Stab/JG 2. Bauer was to be particularly successful against the RAF incursions in the region during mid-1941. He claimed his first victory on 10 July, when he shot down a RAF Spitfire fighter over Le Havre. By the end of September, Bauer had five victories to his credit, all Spitfire fighters. By the Spring of 1944, Bauer was serving with JG 53. Hauptmann Bauer was assigned to the Stabsstaffel of I./JG 53 based in Italy. On 2 April, he claimed a USAAF B-24 four-engine bomber shot down from a formation returning from raiding industrial targets around Steyr in Austria. In the same combat Oberleutnant Walter Seiz (14 victories, POW 23 August 1944) failed to return and Bauer was named as acting Staffelkapitän of 3./JG 53 in his place. On 12 May 1944, I./JG 53 arrived at Targosul-Nou airfield in Rumania. The unit was tasked with the protection of the Ploesti petroleum production and processing facilities. 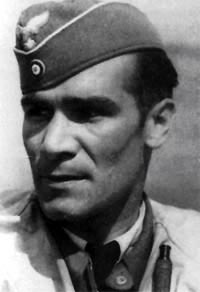 On 6 June, Bauer participated in the interception of 310 USAAF B-24s attacking Ploesti. He claimed a B-24 shot down in the subsequent aerial combat but the victory was not confirmed. Bauer participated in the interception of 220 USAAF B-17 and B-24 four-engine bombers targetting Ploesti. In the subsequent aerial combat, Bauer was shot down and killed in Bf 109 G-6 (W.Nr. 163 606) “Black 1” by escorting USAAF P-51 fighters northwest of Amaru. Franz Bauer was credited with nine victories. Included in his victory total are four four-engine bombers and five Spitfire fighters.